TCI Home Solutions offers handyman services in Phoenix that you can trust. As a small, family-owned business, we understand how important your home or business is to you, and that is why we treat all our handyman projects like we were doing them on our own house. At TCI, we have been providing handyman services to Phoenix residents for years, always bringing high-quality craftsmanship and a sense of pride to each and every project. TCI Home Solutions can handle just about any project on your to-do list. Our experienced, trained handymen can help you tackle any project that you need help with around the house. There is no project too big or too small. We strive to treat all of our customers with the same respect that we would want from someone visiting our house. 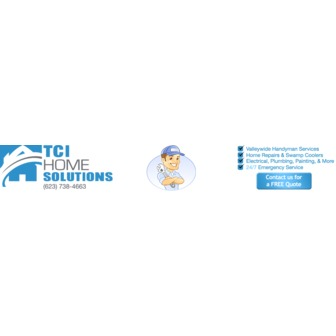 When it comes to Phoenix Handyman Services, you can't go wrong with TCI Home Solutions. To learn more about our Phoenix Handyman Services or to schedule a visit, contact us today.